The photo below was found among some other WWI photos. 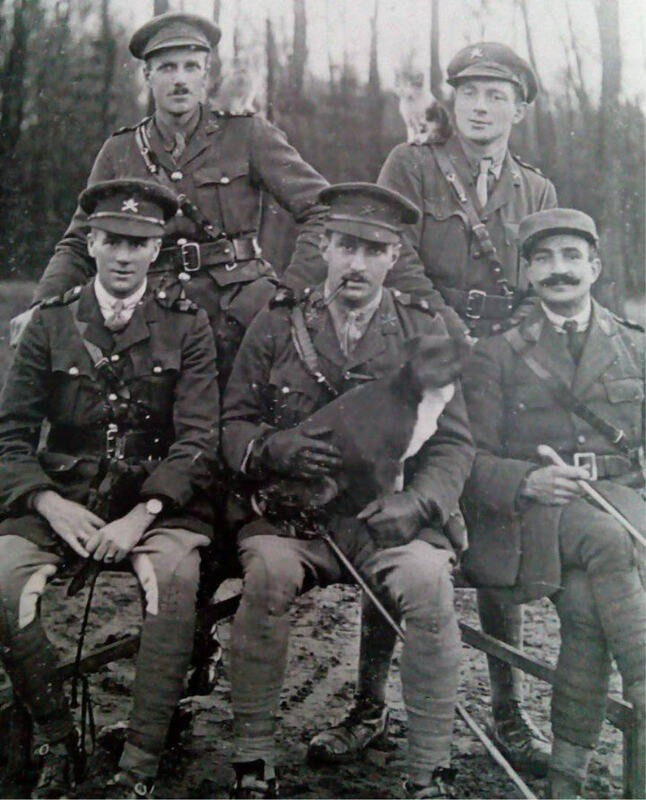 It seems to be from a book (rather than an original photo) and has been (firmly) glued onto a piece of board (so impossible to see any text on the other side which might help with identifying the uniforms). I'm mostly interested in the two officers bottom left and bottom right. Googling has led me to think that at least three of the officers are British Army, maybe Machine Gun Corps. Can anyone confirm this? The officer bottom left also seems to be British but there are two differences: the stripes on the inside of his trousers (riding breeches perhaps, as suggested by kimchi lover) and the colour of his shirt (or were officers allowed to wear different colour shirts?). Do these differences signify anything? The fifth officer (bottom right) is a bigger mystery, though. The cap suggests not British. The most logical answer would seem to be French but I can't find any French uniforms on Google images to confirm this. Looking at the list of belligerents in World War I, there are quite a few other possibilities (Serbia, Belgium, Italy, Portugal, Greece...) but googling hasn't turned up anything. Note: Three of the officers have pets. This was common during WWI so I don't think it has any relevance to the questions above. As requested by LangLangC, I've worked on the picture a bit but not sure if it's much help (click on the image for full size). The mounting (on black board) seems to have been done within the last few years as there is little sign of aging. 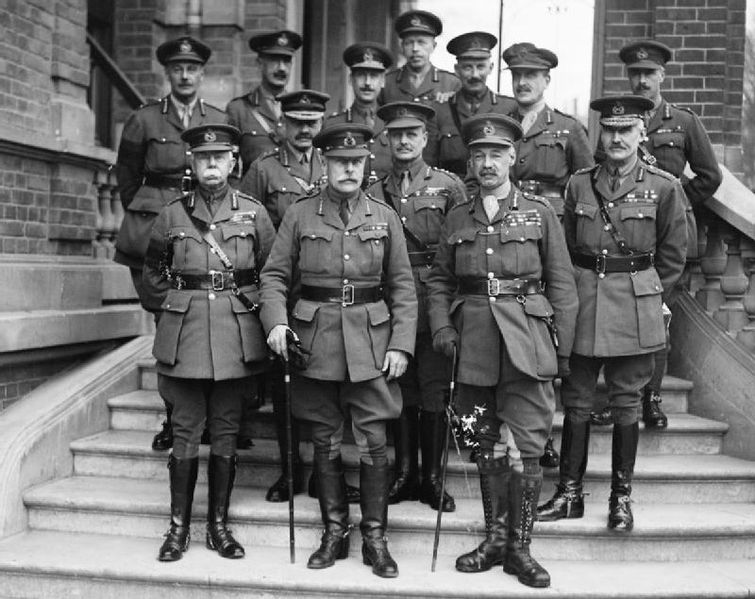 A-D are Officers of the Machine gun Corps of the British Expeditionary Force. That photo and the information available surrounding it makes a tough nut, the following is therefor only a preliminary partial answer. 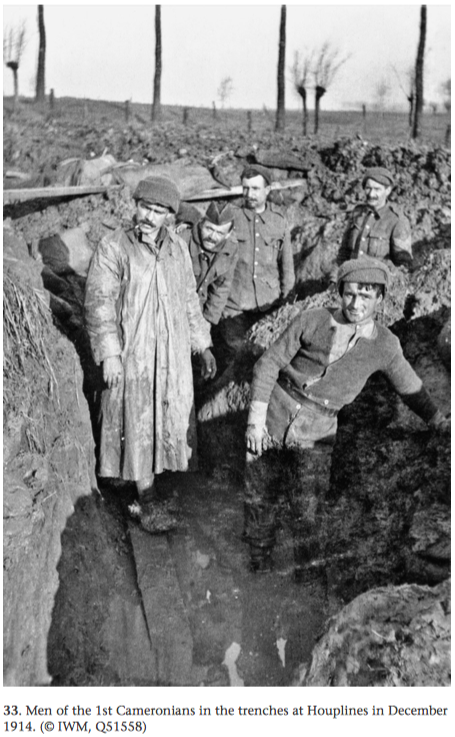 From: Jane Tynan: "British Army Uniform and the First World War: Men in Khaki", Palgrave Macmillan: London, New York, 2013, p78. The Machine Gun Corps. Cap badge, 1915–22. –– 154. The Machine Gun Corps. Officers' collar dog. Bronze. From: F. Wilkinson: "Badges of the British Army 1820 to the Present. An lllustrated Reference Guide for Collectors", Arms and Armour: London, 1997, p 62. From: Peter Hart: "Fire and Movement. 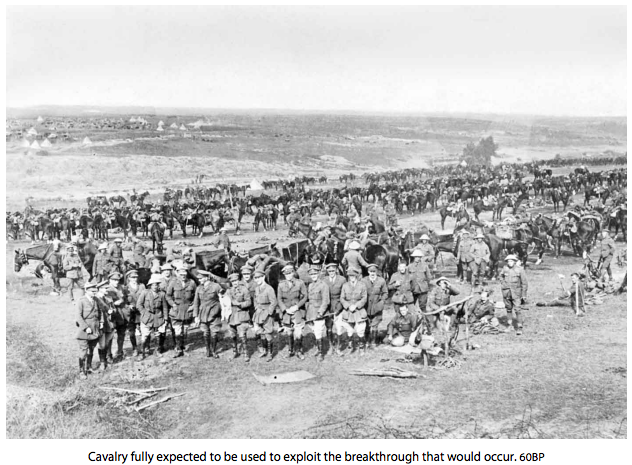 The British Expeditionary Force and the Campaign of 1914", Oxford University Press: Oxford, New York, 2015. The most intriguing facial beard styles on display here are the clean shaven faces of B and C, the little moustaches on A and D and the "old" style wide moustache on E. All except E might point to a trend that of facial hair style that emerged after tight fitting gas masks were referred over stylish beards. This makes a date of "after 1915" more likely. 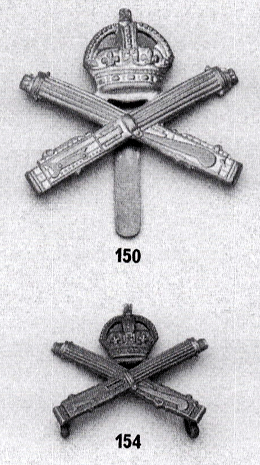 The shoulder insignia on A, B, C, and D seem all to differ, indicating quite different units the soldiers belong to. E Has further no corps insignia on his lapels but a triangular badge that is not for me to make out in this resolution. The shirts seem to be of quite a lighter colour on C over all and just the collar on E. But the universal use of collar pins (or collar bars, collar clips) under their neckties would place all of these officers firmly in the British or Empire forces. No other army of that time seemed to have this preference for an arching tie sticking out of the uniform. From: William Langford: "Images of War. Great Push. Battle of the Somme 1916", Pen & Sword: Barnsley, 2012. This is the main cause for most of the non-uniformity issues on display here: officers were in part expected to purchase their gear from their own money but were also given even more leeway in style compared to frontline duty enlisted man. Some basic regulations had to be observed, but the exact cuts, materials and sometimes even styles were widely mixed to an extent. This is especially true for either frontline conditions or off-duty times beyond the trenches. Conclusion All this taken together might indicate that this picture was taken more in the later part of the war. It displays at least four officers from the British Expeditionary Force, from different units within the machine gun corps and one that might be from other Imperial forces, if he is not also in the Royal Army. Although this represents a lot of educated guess work and indirect evidence, for A–D the inferences presented so far seem adequate. Soldier E remains a bit more elusive. He might indeed be French after all. It is not only the more impressive moustache that would indicate his membership. 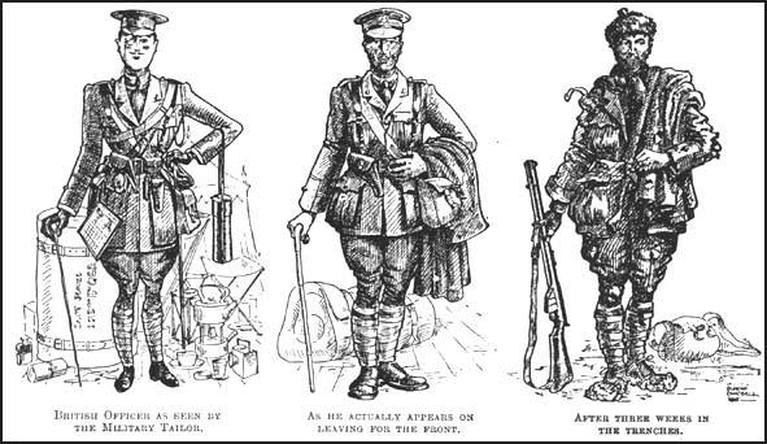 While virtually all French uniforms of that era are depicted either with a standup collar, sometimes like a mandarin collar, or a very wide falling collar, there were apparently some instances of imitating the British. 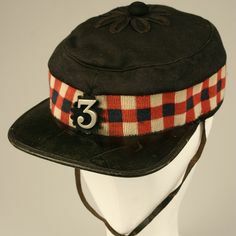 The undecorated and very flat cap might then be a kepi and the slightly longer jacket would also be a slightly better match. The lapels however are even wider on E than in this picture. 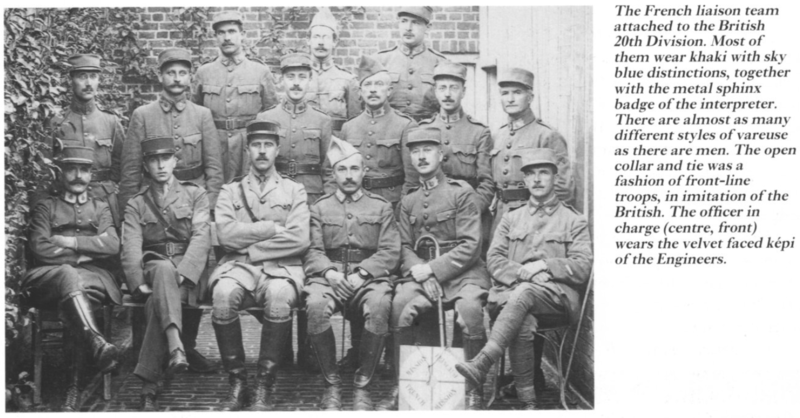 However, the cut of the uniform still points more likely towards British, New Zealand, Australian, South African or Portuguese armies than French. But all these possibilities are still more likely than a Uniform of Russian, German, Austrian, Italian, Romanian, Polish, Bulgarian, Serb, Belgian, Greek, Japanese origin. Unfortunately uniforms in actual use seemed to be less uniform than often expected. 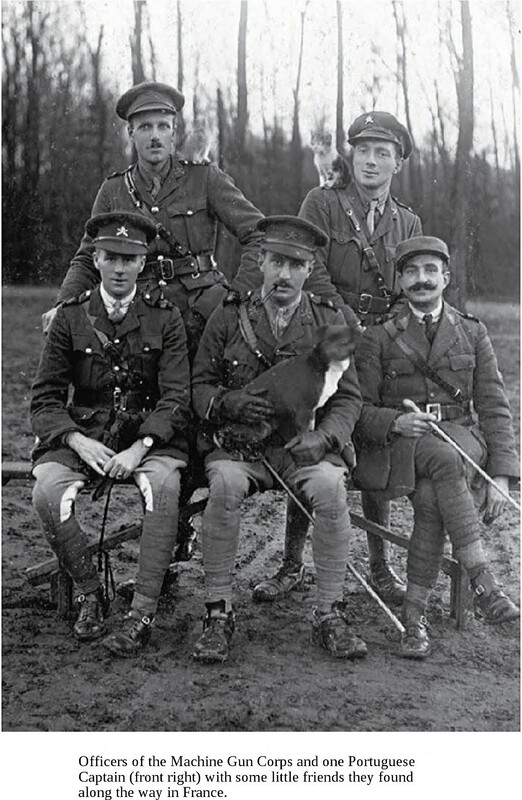 Found by Lars Bosteen in: Neil R. Storey: "Animals in the First World War ", Bloomsbury: London, Oxford, 2014, unpaginated/ebookpage69. Solving the national identity of Mr E. In this versiopn of the picture the Portuguese officer seems to carry a quite large swagger stick. So large that in fact it looks more like a vine staff or pace stick. Not the answer you're looking for? Browse other questions tagged world-war-one identification uniform or ask your own question.